NEW! Updated for PowerPoint 2016/365! Learn easy principles and techniques that designers use. You need to create high-impact, professional-looking slides. But if you aren't a designer, that can be a difficult task. This e-book will show you, step-by-step, how to easily get the results you want. Plus bonus downloads: a theme, template, and sample slides. Plus 5 short video tutorials to make implementing the principles easy! Rise to success as a speaker! You've probably heard some famous speeches by charismatic speakers — Winston Churchill, Martin Luther King, John F. Kennedy — and more. Did you wish you could speak like that? 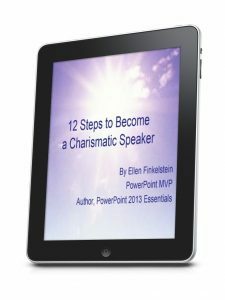 The qualities of a charismatic speaker are simple -- and even obvious. Read about each one and get steps to grow in these qualities. 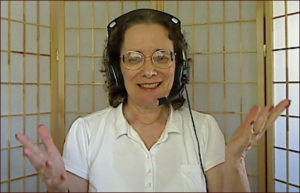 Includes links to brief audios and videos to inspire you to get there! Over 50 pages! Discover the 3 mistakes most presenters make in their persuasive presentations. 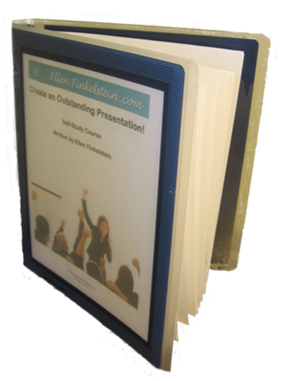 This book is about how to succeed with sales presentations, internal presentations any time you need to persuade. If you're a sales rep or a business manager recommending proposals, you'll find this e-book an invaluable tool. Now updated through PowerPoint 2016 and Office 365! For everyone who never took a course or read a book! These tips will fill in the gaps, speed up your work, make presentations easier, and help you get better results. 100 pages, in e-book (PDF) format. Only $19.97! Teachers! 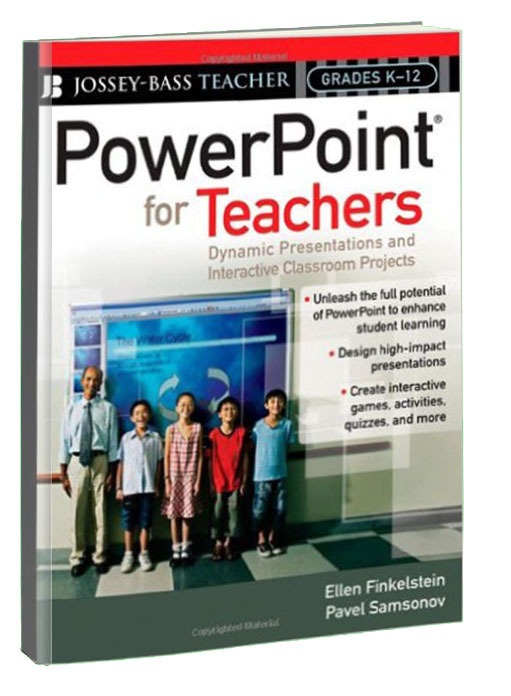 Learn how to use PowerPoint in your classroom for presentations, games, quizzes, and more! 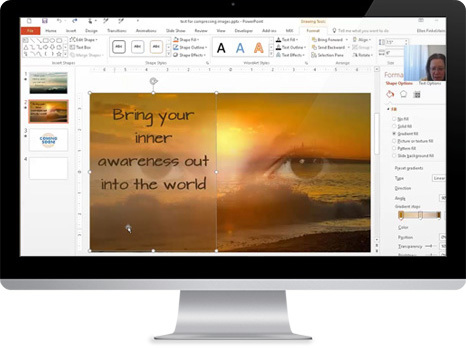 Create dynamic presentations and interactive classroom projects. Engage students in your projects and as they create their own. Includes loads of step-by-step tutorials and examples. "It is a great teacher friendly resource. 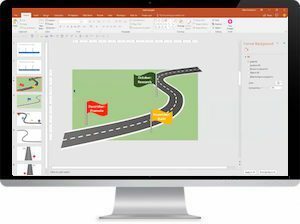 It is easy to use, and really helpful in figuring out PowerPoint!" "I did not know that I could make a quiz/game using PowerPoint! I am getting all kinds of ideas of how to use this in my classroom!!!" Are presentations vitally important to you? Do you want to engage your audience more? Do you need to learn how to make your slides more visually appealing? Would you like to know how to design slides faster? Do you struggle to convey ideas with less text on your slides? Click here to check out Power Pointers Quarter Hour. Quick tutorials in 15 minutes every week! Nail that presentation! Communicate more clearly, get your desired response (whether informing, training or persuading), and drive home your message. 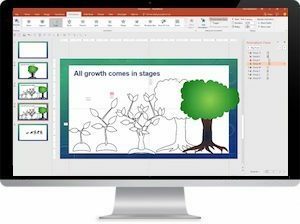 If you want to fully engage your audience and turn Death by PowerPoint into Life by PowerPoint, we'll work together to create a Peak Presentation! Discover simple techniques based on solid research that everyone can learn! See great before-and-after examples that you can use as models. You"ll hear how one marketer used these techniques to increase his conversion rate from 50% to 70%. • Get cool animation techniques and technology tips that will make the process easy! This self-study course will give you the tools and techniques you need to succeed with presentations. It contains the same content as my 3-day workshop, but you work entirely on your own, at your own pace. You'll learn how to write and organize your content, design memorable, visual slides, and deliver in a way that engages your audience. These are recordings of webinars I did in 2016. Get all 5 for the price of 4, or buy individually. 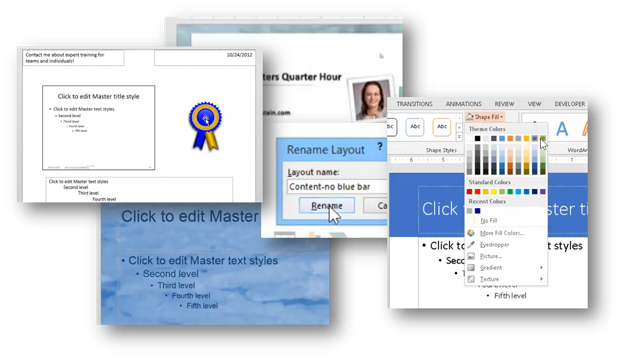 Present Interactively--Your Audience Expects It! These useful concept slides in 5 styles help you communicate powerfully! 50 business concepts clearly and attractively designed for you. All you have to do is choose the right one for your message and add a slide title! Get 5 tutorials for the price of 4 on our most requested topic! Get 5 tutorials for the price of 4 on one of our most requested topics! Get 5 more tutorials for the price of 4 on our most requested topic!